Let's All Play "Snoop Dogg or Real Dog?" We love shows that teach things, are very in to the esoteric, and are funny. So our new favorite is "You're the Expert," which has three comedians trying to figure out the field of a guest expert. A few months ago, an episode featuring Dr. Alexandra Horowitz, an expert in dog cognition, gave us "Snoop Dogg or Real Dog," a game that is harder than you think. 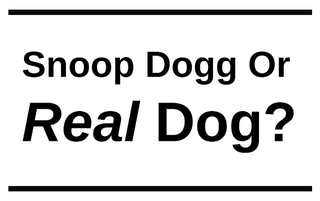 You can listen to the whole episode with Dr. Horowitz here, but before that, you can play the game created by host Chris Duffy: Snoop Dogg or Real Dog. As a researcher in Horowitz's lab, I was in stitches seeing how the research that I am so intimately familiar with could be easily misconstrued to describe Snoop Dogg. After making their guesses, everyone got to learn about the research in question (and if the sentence was about Snoop Dogg, we all just laughed). You too can see if 'Snoop Dogg or Real Dog' tickles your funny bone. Hecht also asks the question of how humor has increased your understanding of science? Comedy has increased my knowledge of all areas, because things that are funny are more memorable. That's why my favorite teachers growing up were also the most entertaining. And why I majored in history (and why the Horrible Histories show is my own personal catnip), because I loved finding bits of humorous trivia from the past. So I ask the same question: what joke/sketch/monologue made you learn something?